A conversation with Patrick Ayoub, founder of Detroit Watch Co. 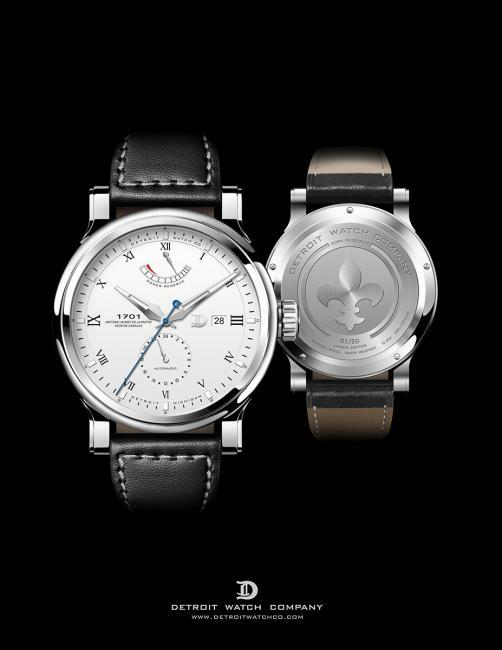 The 1701 pays homage to to the year when Antoine Laumet de la Mothe, Sieur de Cadillac founded Detroit. 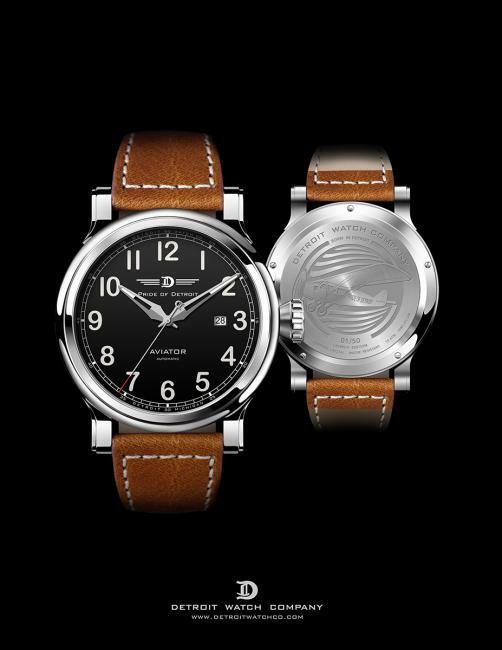 Detroit is becoming a North American watchmaking hub, there is Shinola, recently we have Canvas Watch Co and now, Detroit Watch Co. is making his entrance with two automatic pieces, the dressy 1701 and the Pride of Detroit Aviator. When I saw them on the Detroit Watch Co. website, I was immediately captivated by the balanced proportions of these pieces. There is something in the overall design that inspires maturity and confidence, something that it is rare to find in new brands. Patrick Ayoub, an industrial designer, with a vast experience in car design, during the past 11 years he was also designing watches for different brands. Finally, in 2013, he and his wife Amy, also a seasoned designer, decided to take the plunge, by starting their own watch brand that would be based on their passion for design, love for timepieces and esteem for the history of Detroit. I was pleasantly surprised to find out that Patrick is actually a Montreal native. He’s a well-traveled man; he spent his early childhood in France, moved back to Montreal and after graduating from a design school in California, went to Europe to work as a designer for BMW and Volkswagen. Besides English and French, he’s also fluent in German and Spanish! I had the chance to talk to talk to him over the phone, to find out more about the brand, about Detroit, his approach to design and his upcoming project. WatchPaper: I saw the website and I really liked the watches, than you sent me your drawing and they are amazing. Before we would talk about design, let’s go back to the beginning, why start a watch company? Patrick Ayoub: I have always loved watches and it’s interesting that when I would like a watch and buy it, be that a cheap watch or a slightly more expensive piece, it was always “if I could just do it that way, wouldn’t it be better”, but I never got around to it, as my career as a car designer working for BMW and Volkswagen kept me busy. 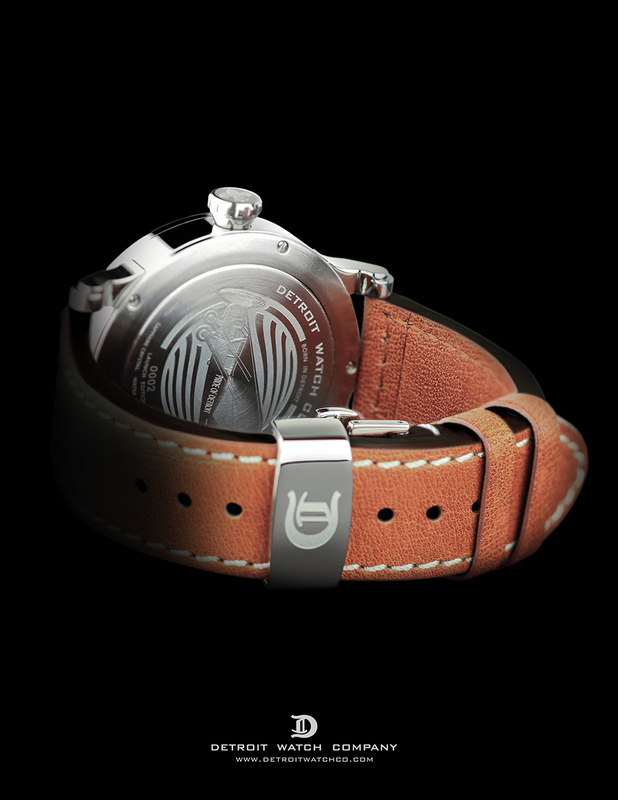 In 2003, I co-founded a watch company in Michigan, the Bozeman Watch Company that we based in Montana. With a supply of ETA movements in Switzerland, and our case maker in Pforzheim, we began the process of creating the new timepieces. Through all this, I met Hartwig Balke, who is co-owner of Towson Watch Company in Towson Maryland. 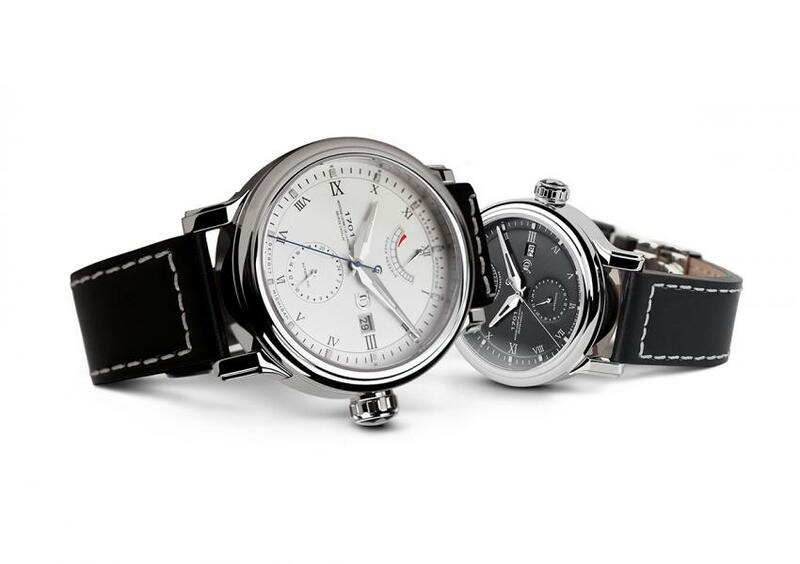 Hartwig is a master watchmaker and became a mentor in watchmaking. We still work to this day on watch projects. After selling my interest in the Bozeman business, I continued to develop watches for various clients. Pride of Detroit Aviator timepiece by Detroit Watch Co.
For a period of six years, I’ve been designing watches for other people and all along the people that know me, kept asking why I don’t start my own brand. I wasn’t ready at the time, because it was tough with the Bozeman thing and I enjoy drawing, I like designing, creating. I would work for companies that would order either 100 pieces or 500 pieces and I would use my contacts in Germany or in Hong Kong to manufacture the watches. When Shinola came on the scene in 2012 our friends began to push us to create our own brand but we were not yet ready. We needed a story. In August 2013 while visiting an art gallery in Detroit with my wife Amy, we decided on the name “Detroit Watch Company.” A brand based on the history of Detroit. Each collection is named after something from Detroit’s history, such as the 1701. The founding of Detroit by Antoine de la Mothe Cadillac, it is the French history of Detroit that to me as a Francophone living in Detroit, I found appealing. There is something that intrigues me as a Canadian. These days, when you hear Detroit, it has a negative connotation because of the economic struggle; I’m wondering why a luxury brand would choose this name? Detroit is interesting. Having lived in Montreal, Munich, Barcelona and other beautiful cities, when you come to Detroit, you see the hidden gem and the forward movement that is taking place to rebuild the downtown. Detroit is slowly coming back. There is some beautiful architecture throughout the city. My wife Amy was instrumental in showing me Detroit and everything great about it. There is also Metro Detroit, the outer suburbs (think the island of Montreal… we are all Montréalers). This holds true for Metro Detroit… we are all Detroiters. You have the market, you have the supporters, you have the branding of Detroit that became a cool factor and we thought, we could do something with this. The deployment buckle on the The Pride of Detroit Aviator is decorated with an engraved D.
You sort of answered my next question, who are your target clients? For every person that has a negative view of Detroit, you have 1000 people supporting it and believing in it. Our clients have been professionals from Detroit and metro Detroit (the surrounding suburbs). We also have many clients from around the United States, who are either linked to Detroit and like our story and design, or they are expats and proud to wear the Detroit brand. That’s where the market is for us. Our target is 500-1000 timepieces a year. We see many watch brands using crowdfunding to launch their product, why you chose to not go down that path? There have been some very successful launches on Kickstarter, but for us we did not want the general public to fund us. We are fully funded. Our pre-orders of the launch editions have been an excellent way to measure the demand. A side view to the The Pride of Detroit Aviator will reveal the decoration of the crown and the elegant lines of the lugs. I saw you’re assembling the watches in Detroit, is it you doing this job? For the moment, I will be doing the assembly. If we hit 1000, we will look into adding another assembler. Why Detroit? By managing our own assembly, we can make custom runs of 20 or 30 watches with a specific design if needed. 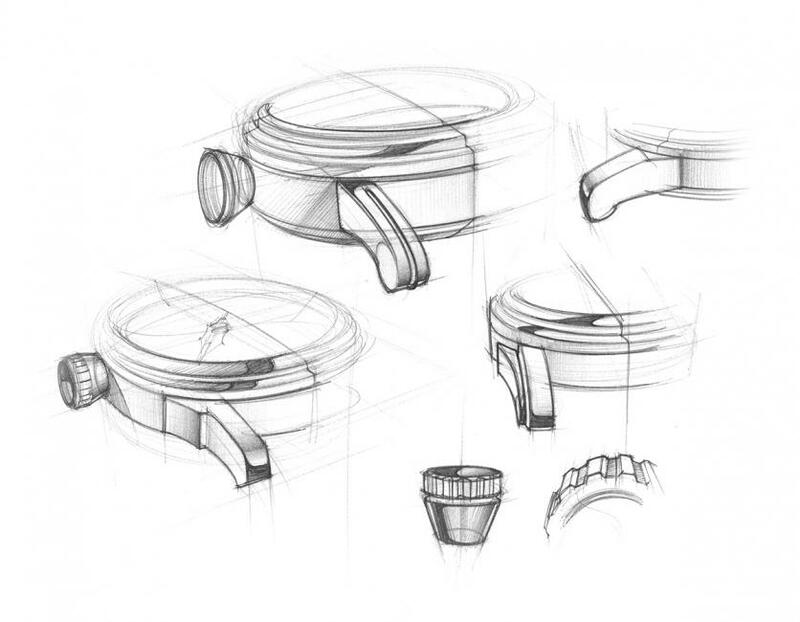 This is a design question – what did you find more challenging, designing your own watch or designing for a client? It depends on a client, but it is easier to design your own brand. You can be your biggest critic without too much outside influence. For us at Detroit Watch Company, design and the creation of a timepiece is where our passion lies. I can spend days sketching, I’m still very old school. 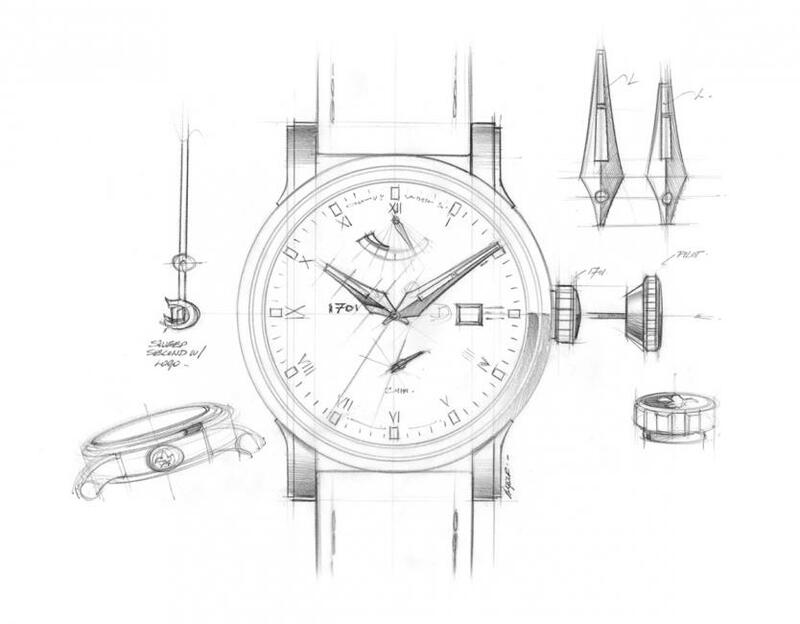 It starts with a pencil and a piece of paper and then you get into working with the layouts, the movement, the computer, the graphics, but I would spend days and days sketching to get to the theme and the look of the watch. Many watch companies use off the shelf components. But it’s not the same as designing our own, where we have full control over the design and proportions, such as our hands on the 1701. We design and review all the parts, make changes and start again. If we would have taken something off the shelf it would be plug-and-play, you get it delivered and you’re done. It’s like any design project, if you create from scratch that is the biggest challenge, but it is also the biggest satisfaction. Right now, we are working on a ladies watch and a chronograph, for this fall and I’m back to sketching. Without going away from the theme we have created, like many of the top Swiss and German brands, you want to have a continuation to which people can relate to. Amy is very involved with the ladies collection, bringing a new design perspective. How is a Detroit Watch born? We usually start by choosing the movement, because it will dictate the dial proportions. For the 1701, I wanted something more intricate, I like the power reserve and the 24 hours front subdial. With that established, we are choosing a simpler movement for the ladies. It still going to be automatic and it will have the same style as the 1701, minus the subdials. 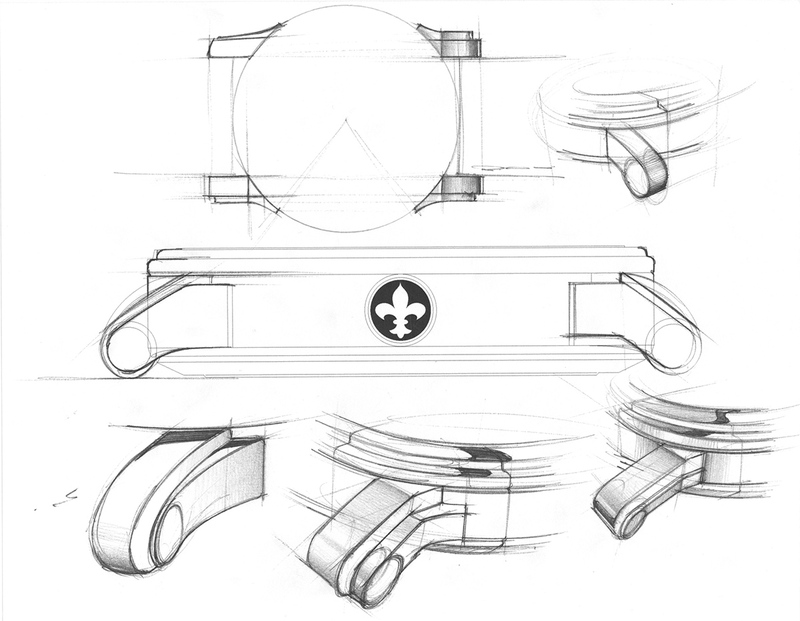 Detroit Watch Co pieces start as a hand drawn sketches. Looking for the perfect lug design. Yes, this model will have a Swiss movement. At this time, Miyota does not have a chronograph such as the ETA 7750 series. Our chronograph will be competitively priced. You also mentioned ladies watches, would you like to develop on that? That one has to come out before the Woodward and hopefully; we will be sending the drawings for the case to our manufacturer in the next three weeks. 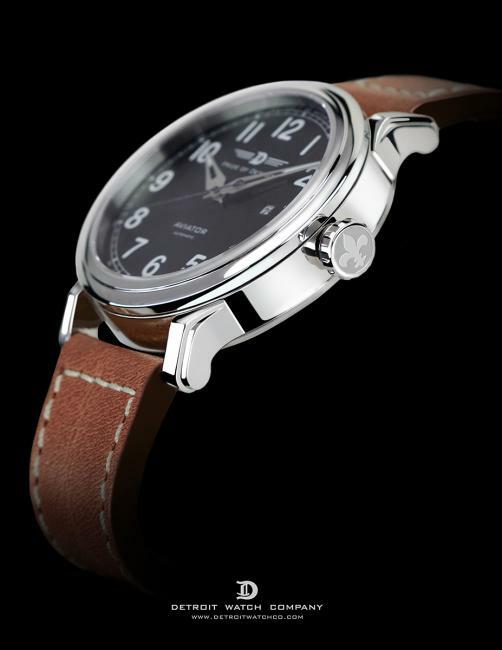 It will be an evolution of the 1701 and the Aviator case, a bit thinner and it will be 40 mm instead of 44 mm. The 40 mm will be perfect, because it’s still a good size and I can use that case for a unisex watch that would appeal to men who find the 44 mm to big. You mentioned that you will have a version with Arabic numerals, based on a feedback you got. Do feedbacks influence your design decisions for future models? It doesn’t influence the design, but it reminds us of the choice we must offer to our customers. One comment we received on the 1701, was for an Arabic numeral dial version. At this time we do have the 1701 with Arabic numerals already in the pipeline. Thank you very much and let me wish you best of luck with your venture!